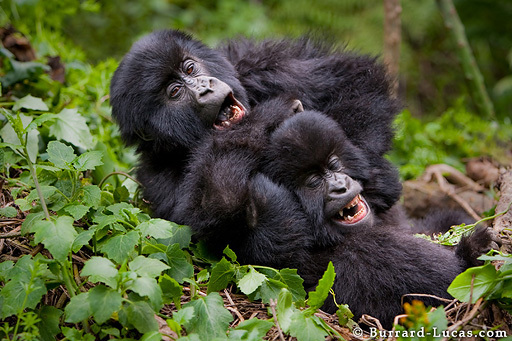 These baby gorillas were photographed in the dense, misty forest of the Virunga Massif, on the border of Rwanda and the Democratic Republic of Congo. Mountain gorillas have much longer hair than their Lowland gorilla cousins which helps to protect them against the cold, damp climate of their high-altitude habitat. It was an unforgettable experience being close to these cute gorillas as they play fought and tumbled around in the foliage!